If you’ve been following Cheese + Champagne for the past two years, you’ve read our musings on cheeses from all over Europe – France, Spain, Italy, Great Britain, the Netherlands, Switzerland, Ireland, Greece and Portugal. And while there are many, many European cheeses that Colleen and I love and enjoy on a regular basis, we’ve taken special notice of the newer artisanal cheeses that are made right here in the good ol’ U.S. of A. Many are so new that they didn’t make the Wine Spectator 100 Great Cheeses list that sparked this blog, and now through we’re practically done with the list, we decided it was time to turn our focus exclusively on America. We won’t give up eating our beloved Chaources, Roqueforts and Manchegos, of course, but you’ll be reading more about the exciting newcomers and rediscovered favorites from our own shores. I can’t think of a better cheese to start with than one hailing from my home state of Wisconsin. 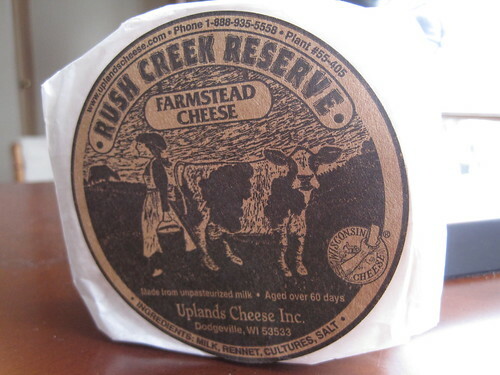 Uplands Cheese Company of Dodgeville is making it a very merry holiday for all of us cheese fanatics with the release of its first batch of Rush Creek Reserve. Inspired by the Swiss Vacherin d’Or, which isn’t available in the United States due to FDA regulations on imported raw-milk cheeses, this dreamy, drippy cheese is carefully made with autumnal raw cow’s milk and aged for just 60 days. Each 12-oz. 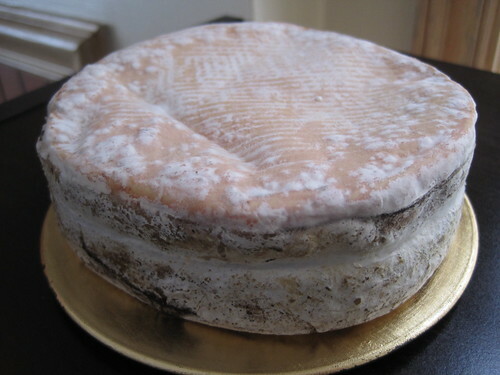 wheel is bound with spruce bark and washed with various bacteria that give the rind its orange color. 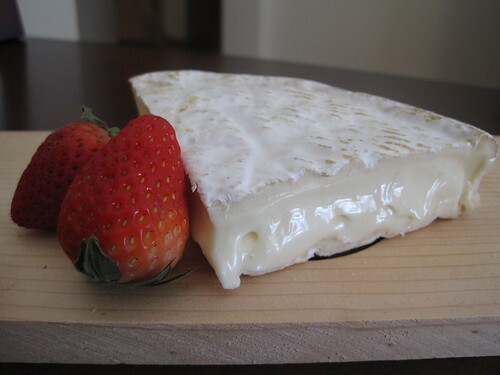 You’ll want to avoid tasting that rind, though – its grittiness mars the creamy goodness that lies underneath. Rather than cutting wedges from the side, run your knife along the cheese’s circumference on top, peel off the rind and dig in with a spoon. Anyway, back to the cheese! Saying it’s good is an understatement. Saying it’s great is an understatement. 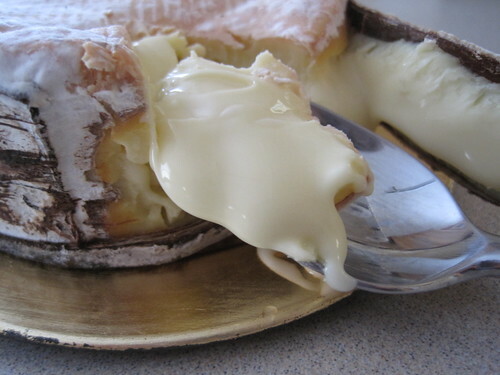 This is a world-class cheese that can go against Epoisses, Langres or any other washed-rind cheese that France has to offer. The paste is so sumptuous, so sublime, that it’s a dessert, not an appetizer. 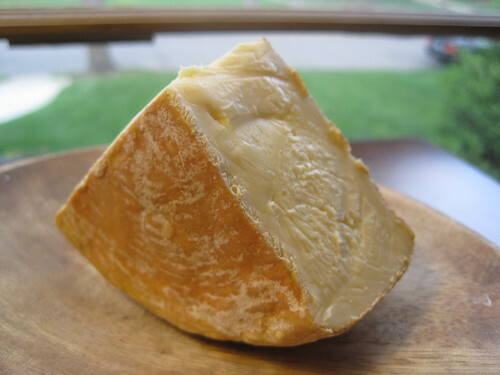 Not as stinky as Epoisses, Rush Creek Reserve still has the barnyardy aroma that a cheese lover associates with spectacular cheeses, as well as a meaty, slightly smoky flavor that is easy to savor. You can protest all you want that washed-rind cheeses are too strong or stinky – I challenge you to have one spoonful of Rush Creek Reserve and not be an immediate convert to the washed-rind cause. This is a truly special cheese and the perfect gift for the caseophile in your life. Alas, it’s not easy to find. Its seasonal nature only allows Uplands to release Rush Creek over a few short months, and not all cheese shops have received shipments yet. I was lucky to snag one at France 44 (thanks, Benjamin, for putting me on “the list”), but Colleen hasn’t been able to buy one in Northern Virginia so far this winter. If your local cheese shop hasn’t had it in stock yet, be sure to ask your cheesemonger if he or she has put in an order. This is one cheese you won’t want to miss, and it’s worth every penny (I paid $24 for my wheel). And when you do get your hands on it, pair it with a Riesling, Gewürztraminer or a malty beer, per Andy’s suggestions in his interview with The House Mouse last month. Psst…are you on Facebook? Who isn’t (besides my parents)? Be sure to “like” us on Facebook to keep up to date on all things C+C! What first attracted to me to this stinky Vermont cheese is its name – Oma is German for “grandmother,” and my next-door neighbors growing up had an oma and an opa. I always thought those were funny names for grandparents (even though I had a bubbie and a zaydie), and they always stuck in my mind. So when I started hearing buzz about a cheese called Oma from the von Trapp Farmstead, I couldn’t forget about it, but I didn’t try it until this week. Normally, one might think this would be an unusual cheese for a 39-week pregnant woman who is very sensitive to smells to choose. Of course, I am no normal 39-week pregnant woman. 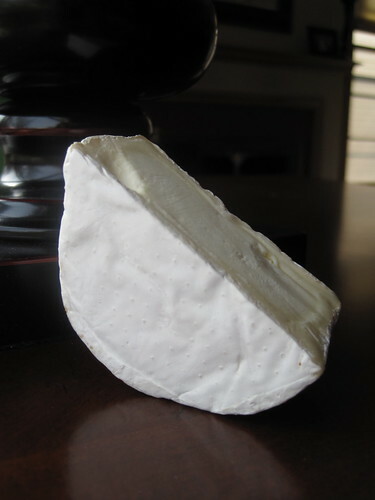 It’s a pretty potent one, though pleasantly so, similar to Jasper Hill Farm’s famed Winnimere, which I also bought this week. (Fun fact: Oma is aged at the Cellars at Jasper Hill!) I remember saying to my cheesemonger that it didn’t seem so stinky when I tasted it at the shop, but the beefiness of the cheese really comes through if you let it sit on the counter for at least two hours. 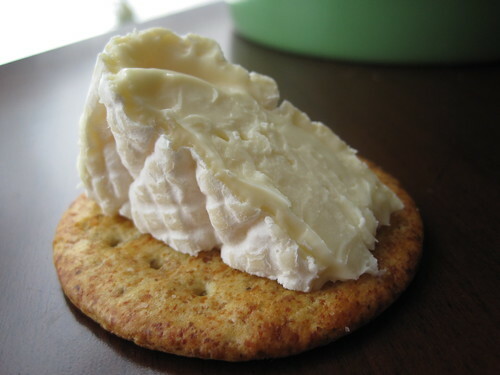 The paste doesn’t ooze like a triple-cream but rather gets soft and ever-so-slightly rubbery. 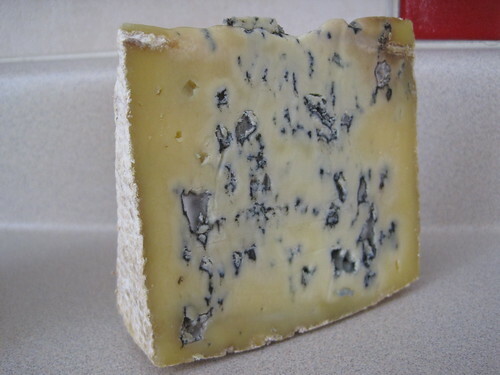 Though I typically eat the rind of most cheeses, I found this one to be a little too gritty for my taste. Pair with a full-bodied, dry white wine or Belgian beer (per Formaggio Kitchen’s recommendations) and get Oma’s funk on for yourself.